Trencher attachment for Mini Track loaders including Bobcat Mt series, Dingo or others with similar mount plates. 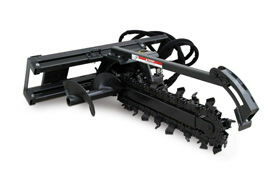 * Please call us for any questions on our bobcat/dingo trencher attach. 6 inch x36 inch rentals in Portland OR, Gresham OR, Milwaukee OR, and surrounding metro area.